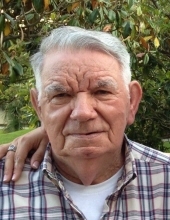 Elmer Franklin Doyle, 90, widower of Helen Louise (Rowe) Doyle, formerly of Lofton, went to be with his Lord on Sunday, January 27, 2019 at Augusta Nursing and Rehab in Fishersville. Mr. Doyle was born on September 21, 1928 in Raphine, Virginia, a son of the late Robert Franklin and Lottie May (Cash) Doyle. In addition to his parents and wife, Mr. Doyle was preceded in death by a son, Robert Franklin Doyle and a daughter-in-law, Patricia Elizabeth Doyle. two grandchildren whom he loved dearly, Tonya Doyle and her daughter Ariel Walker “great-granddaughter” and Amy Doyle; five sisters, Alma Moran of Woodstock, Cecil Nuckoles, Betty Jones, Estie Barnett, and Jo Ann Miller and her husband Ben of Stuarts Draft and a number of nieces and nephews. The family will receive friends from 6:00 p.m. to 8:00 p.m. Thursday, January 31, 2019 in the Coffman Funeral Home and Crematory. A Celebration of life will be conducted at 2:00 p.m. Friday, February 1, 2019 in the Coffman Funeral Home Chapel by Pastor Joseph Condro and Pastor Joey Locklear. Burial will follow in the Pines Chapel Presbyterian Church Cemetery. Active pallbearers will be Rick Harris, D.W. Miller, Steve Barnett, Jeff Barnett, Jeff Marks, Tony Fitzgerald, Danny Fitzgerald, and Robbie Rowe. The family would like to express a sincere “Thank You” to Dr. H. Lynn Moore of Mint Spring, the staff at Brookdale of Staunton, and Augusta Nursing and Rehab. It is suggested those desiring make memorial contributions to the charity of one’s choice. To send flowers or a remembrance gift to the family of Elmer Franklin Doyle, please visit our Tribute Store. "Email Address" would like to share the life celebration of Elmer Franklin Doyle. Click on the "link" to go to share a favorite memory or leave a condolence message for the family.